I recently finished up a bartop arcade cabinet that I’ve been working on for a while. I got the basic design from this instructables post, and tweaked it a bit. So here’s the result: Spartan New Tab. I have a few features to add, but it’s usable as it is. A while back, I decided for some reason that I wanted to make some wooden coasters (the furniture protectors, not the thrilling ride), even though I never use coasters. Being a big Captain America fan, I thought his conveniently shaped shield would make a good pattern (the round one, not this one). Below are the steps I used to make them. I ran across a unique guitar stringing technique today at a pawn shop. Somehow they managed to run all the strings backwards. I don’t know how they’re attached at the other end. I wonder what they thought those little circles at the end were for. It’s a left-handed guitar, so maybe someone told them they had to string it backwards relative to a right-handed guitar and they misunderstood “backwards”? When I was in Brazil last year, I took a bunch of pictures of the view from Cristo Redentor and stitched them together into a panorama. It was a clear day, but the image gets a bit cloudy in the distance. It’s still fun to search around for interesting details. It’s like a giant Where’s Waldo. A couple of years ago, I posted an Android SeekBar preference widget that I’d written. Since then, people have regularly posted fixes and enhancements. This is a new version that includes those fixes. I decided to make a new post because the thread on the old one was getting a bit long, and hopefully those problems will be gone now. Special thanks to Yair from KwazyLabs for layout updates that should make the widget behave itself when the theme is not the default. nintenduh kindly produced a video of the ASCIIQuarium for your viewing pleasure, enjoy! I’ve posted new versions of both Weatherspect and Asciiquarium, so the three people on the internet who still care about ASCII art will be thrilled. Weatherspect v1.11 just distributes some of the critters in the trees, instead of having everything walk along the bottom of the screen. Asciiquarium v1.1 (only 8 years after 1.0!) adds a few new random creatures, plus a fish hook that will occasionally snag an unwary fish. I’ve posted version 1.10 of weatherspect. It just fixes a bug that caused the program to die if certain weather data was missing. You can download the new version from the project page. I ran across this artifact from a bygone era the other day, and went searching for the story behind it. Surprisingly, I could find no pictures of it, so I decided to record it for posterity. 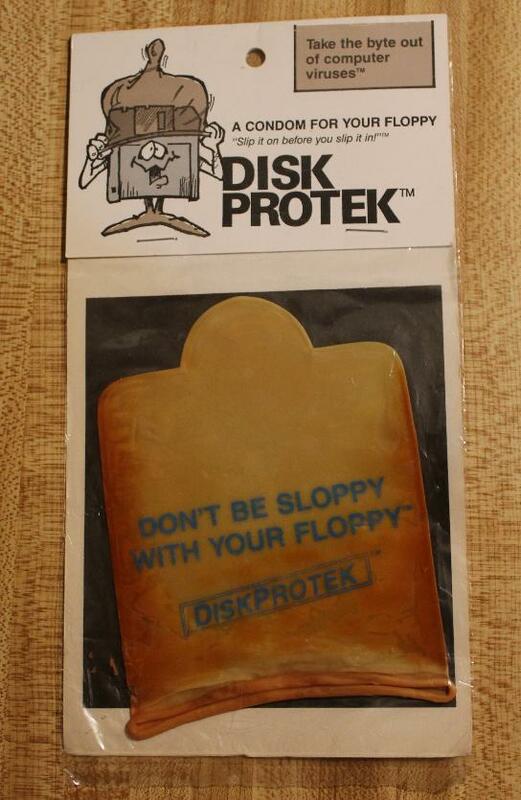 Now future generations will know that terrible computer jokes existed long before facebook, when cavemen had to physically pass the jokes to one another like the very floppy disks the DiskProtek was made to defend. 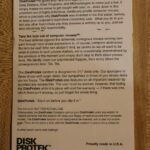 The only reference to the DiskProtek that I’ve found at all is this trademark registration. 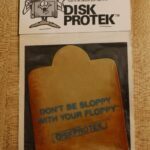 It looks like it’s expired and is available for the low price of $159 if you’d like to enter the lucrative Archaic Computer Novelty business. It hasn’t held up very well, but it’s probably close to 20 years old, so it’s a wonder it isn’t a bag full of dust at this point. 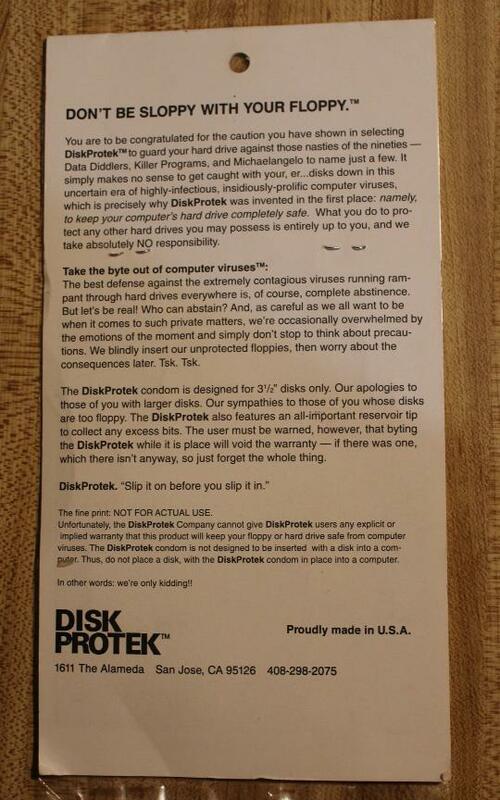 Obviously the DiskProtek corporation produced a quality product. Read on for the text from the back.